Remember my post about buying groceries online? Whenever I had chicken on my shopping list, I tried to buy halal fresh chicken instead of the frozen one. One small problem though, in Sheng Siong online order they are available as whole chickens. It means I need to cut them up to pieces by myself. And I had never done that before. If I buy chicken from my local wet market, the seller would cut it into small pieces for me. The first time I ordered that whole chicken, I thought, how difficult can it be. I knew usually the market guy will either chop chicken into 8 or 12 pieces. I knew those would usually be 2 wings, 2 drumsticks, and the rest were coming from breast and upper thigh being cut sort of symmetrically. That can't be too hard, right? I could get the wings off easily. I could get the drumsticks with a bit struggle. But once I tried to cut the breast part, I think I crushed most of the small bones at the rib in the wrong direction. It just looked, well, crushed. I gave up. And proceeded to ask my husband. Not so surprisingly, he told me he's done it before, and continued to explain on how I should try to feel and find where the bone and the joints are. And it shall be cut on the joints. 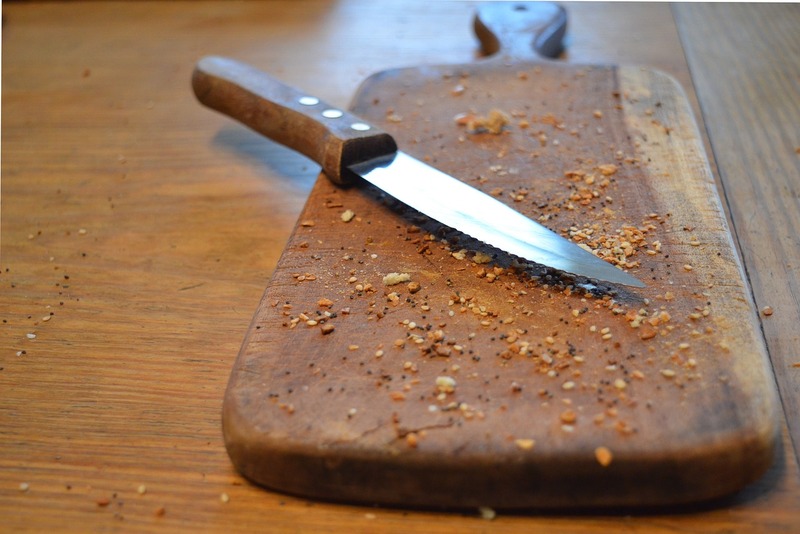 BUT, since he cut so fast, I couldn't really pay attention to how he did that. Assuming I would need to do more chicken cutting in the future, I google it. Here I found a good article on Cutting Up Chicken, and also watched a video about it. Let me go through the cutting process in a short version here. 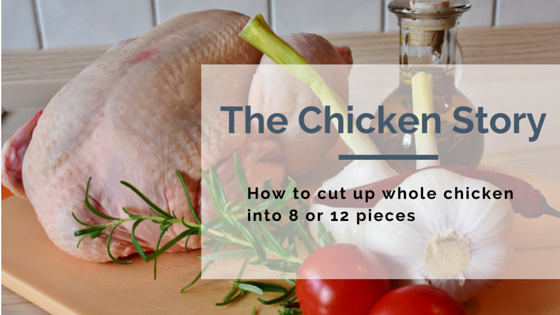 The above article will give you the detailed steps as well as picture of each chicken part during cutting. You can clearly see how and which way you need to stretch the legs or which way to put your knife on. Basically, people usually cut a whole chicken into 8 or 12 pieces. This is how it's done in my local market (you can find how to achieve 10-pieces cut in the same article though). Important point to note, ALWAYS TRY TO CUT AT THE JOINT in between parts, so you can get a clean cut instead of a shattered bone. The first thing you will cut, is the leg. This leg, will then cut into drumstick and thigh. This will give you 4 pieces for both left and right side. Next would be cutting the wing off from the body. For 8-pieces, you will leave the wing as it is. To get a 12-pieces, you will need to cut the wing into the drumlet/drummette and the wingette. This step will then give you another 2 or 4 pieces, again for both left and right side. The last part you would need to handle, is the body, or breast. To get 8-pieces, you simply cut the breast into halves, and to get a 12-pieces, the breast will be cut into 4 quarters. Now, practice on more chicken! Strange enough, but I got some satisfaction when I could cut them *neatly*. Heh. Programmer turned stay home mom. 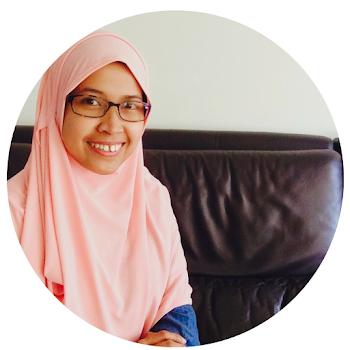 Living with husband and two daughters in Singapore. And Indonesia is still the hometown at heart.